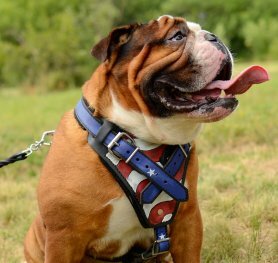 Looking for a dog harness and don't know how to choose the right one? We are ready to help you to make a right choice. Nowadays there is a wide range of harnesses meant for different purposes. We will try to tell you in details about each type of harnesses. It can be used for developing dog's muscles. It is possible to attach a cargo to it, so your doggy will have to work hard to pull it. The example of cargo is a wooden box with sand, bricks or stones inside. You can also attach car tires of different sizes and weights. There are some professional types of dog pulling that are popular during different dog competitions. Most of the working dogs are also taught how to pull. Here is another idea how to use a pulling dog harness with more fun. Our customers do jogging, rollerblading or bicycle pulling. Just be very careful and remember that you are responsible for your canine's well-being. 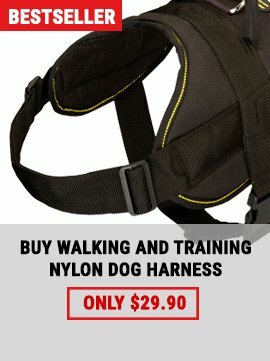 You can choose a nylon or leather dog harness. Nylon is a budget and more functional variant, it fits perfectly for walking in high humidity climate or when raining or snowing. On the other hand, leather is rich-looking, this material is natural and does no harm to your pet’s health. There are many different ways of dog training, and sometimes you need a durable harness for this purpose. The most popular ways to use such a dog harness are attack/protection training, sports competitions, Schutzhund training, French ring, training of police and military dogs. This training supply is strong and easily withstands excessive overloads. It has comfortable soft padding, so your dog won’t feel any discomfort wearing this item. A well-fit training dog harness allows him to breathe freely, so he will be able to stay focused on the training process. Also, there are some types of harnesses with a special handle on the top which provides a handler with a better level of control. This harness is great for well obedient dogs which have minor behavior issues, such as aggression toward dogs, strong prey or hunt drive. While there are many tools and techniques for dog’s behavior corrections, such as choke collars, shock collars, pinch/prong collars, a harness is considered to be the most humane way to apply correction when needed. The main reason is that a harness will not hurt your dog in any way, it will just allow you to keep your dog safe and out of danger. This kind of harness fits for the dogs whose job is to provide physical or mobility assistance. Usually, it is reinforced for additional durability and provides as maximum comfort as possible. The durability and shape of such a harness depend on its usage: whether the dog is the leading one or a brace for the assisted person or if he pulls a wheelchair. A pulling wheelchair harness may have the design similar to sled dog harness model. Such a harness is used for both sports competitions and search/rescue missions. You need to make sure that your dog’s movements are not restricted by harness design; also it should be lightweight and well padded for additional comfort. The light weight of a tracking harness will guarantee longer tracks distance while soft padding will help to avoid skin rubbing and irritation. There are leather and nylon tracking harnesses. If tracking trials or rescue missions include contact with water, better choose a nylon harness. It is made of cold resistant fabrics and keeps your dog’s body warm during cold winter walks. There is a handle on the top, so you can assist your canine when snow is too deep in certain places. Also you can attach a leash to this harness, as it has a D-ring, that’s why there is no need to put a regular collar on your pet’s neck. Specially designed to be as comfortable as possible, this harness is a link between a guided person and a guide dog. It has a handle for better control. A must-have item for service dogs. Military, police, security, search & rescue, patrol and many other working dogs should wear an ID dog harness as part of working environment regulation. We offer ID dog harness with removable Velcro patches which indicate the type of work your canine is involved in. Such design harnesses are used to help injured dogs to go through therapy period and get well. Some of those harnesses remove tension and pressure from the problematic areas, some - can be connected to the special wheelchair, which helps to allow a dog to move in a case when his hind legs are injured. You can use a handle located on the top to lift your dog when it is necessary. The main purpose of such a harness is to show off your dog and make him look stylish. But we also make decorative harnesses as functional as possible by adding a special control handle and by making it comfortable for wearing. Dogs also deserve to be in trend. Budget. We offer a wide variety of dog harnesses which will fit almost any budget. You are welcome to contact us, so we can assist you in choosing a dog harness based on your budget. Fittings. 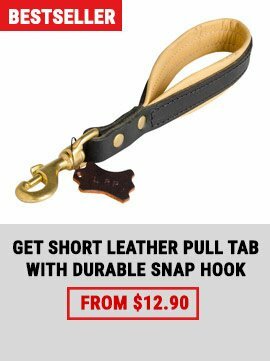 You might notice that there are few types of metal fittings which are used for producing dog harnesses. How to know which type of fittings is the best and safest for your dog? As a low budget solution, we recommend choosing steel nickel plated hardware. This material will make the fittings strong and durable. In case if your budget allows, you can choose brass for the hardware. Brass has all the beneficial qualities of nickel plated steel, but it is also well-known as good material when it comes to dogs with sensitive skin and high sensitivity to allergic reactions. Size. It is very important to measure your dog properly before purchasing a dog harness. Be attentive measuring your canine for a harness as it will help you to avoid the hassle of exchange. All our harnesses are adjustable to certain degree, and if you are not sure which size to purchase and if your dog is not fully grown or falls in between the sizes, please do not hesitate to contact us for immediate professional assistance. Material. For wet weather and high humidity climate, please choose a nylon dog harness, for dry weather both nylon and leather will do. It is important to mention that constant occasional usage of leather conditioner will allow you to use a leather harness in wet weather as well. Please treat your product well to prolong its service time. Padding. We use natural felt paddings to make harnesses more comfortable for wearing. Is this feature important? You definitely should consider it while choosing a tracking or training dog harness. Padded dog harnesses are always more expensive, but you might find that the difference is not so big, especially since you invest in a timeproof dog harness. Handle or no handle. You will enjoy using the handle on the top of the harness as a control tool. When your canine is off the leash and you need to grab your dog fast, the handle is the best and easiest way to do it without any troubles. Some people consider that a control handle isn’t important for a small dog harness because you are not going to control your doggy using this handle. But sometimes it is the fastest and easiest way to lift your dog securely. Reflective trim. It can save your pet’s life. This reflective trim makes your pet visible for drivers and other passers-by in the evening. It is also a great feature for you if you love night walks with your furry friend. Walk your dog safely and be a responsible owner.